It took thirty six years but I finally saw it. I not only saw it, I also entered it and it really is nice. Early in 1979, the future was bleak and I knew not which institution that I should trust with my future. I was then living in Bodija and the first choice was the Methodist School, Bodija. It came naturally, I had spent the previous two (2) years attending the primary school so progressing to the secondary school of the same institution seemed like an obvious choice. My mom thought otherwise, she wanted to make a man out of me and thought I needed to be somewhere different. Somewhere where my character can be moulded and I can also acquire some life skills. She was passionate about Mayflower. 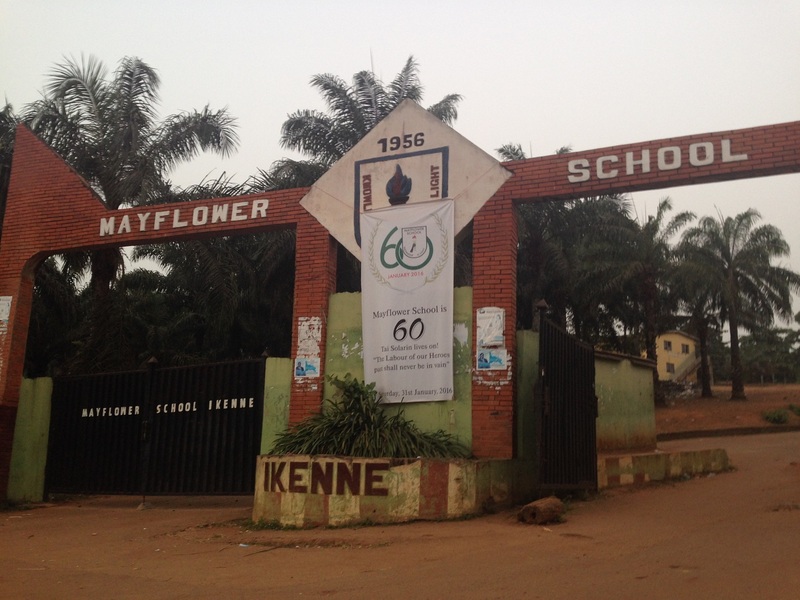 Yes, the Mayflower School, Ikenne. Why Mayflower? Well someone must have sold her the idea that in addition to the academic studies, the students are made to make their foods by themselves. They had their farms, grew Cassava, Yams etc, make their breads and soaps and a lot more. To her, there was no other school like Mayflower and this was where her son must attend. Into the picture came my uncle. He also had his own ideas. It must be Abeokuta grammar School. If that school was good enough for the Kuti’s and Abiolas, he was of the opinion that same was good enough for his cousin. Of course, I had more than one uncle. My other uncle also had his opinion, he would want me to attend Lagelu Grammar School. Reason? He gave none but I can deduce it was because the school bears the name of the first settler of Ibadan. Well, all the Secondary School Entrance examination forms for these schools were obtained and I had to sit for their exams. My recollection was that I passed all these exams but I did not get admitted to all the schools. I couldn’t get through the panel of interviewers at Abeokuta Grammar School. Mayflower Ikenne had no space for me, I was not a product of the primary school and neither did I make it to the reserve list. I must have impressed the interviewers at Methodist High School and Lagelu Grammar School as both schools granted me an admission. The rest of the story is history. Suffice it to say that despite not being admitted into Mayflower, I had always thought of how great my education would have been in that school. As I grew up, I came to know a little more about Tai Solarin and this knowledge kept on fuelling my passion for the school. 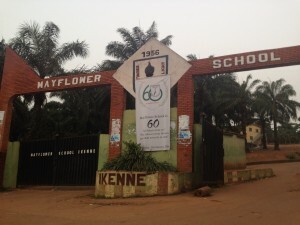 It was a school that I did not even know where it is situated apart from the fact that it is in Ikenne. Today, I was on a trip to Ijebu-Ife and as fate will have it, there was an accident on the way and traffic was diverted through Ikenne. There it was, resplendent with its untainted glory, the Tai Solarin Mayflower School Ikenne. Though I was in a rush to get to Abeokuta, I couldn’t just let the opportunity slip by. I diverted and drove into the school premises. 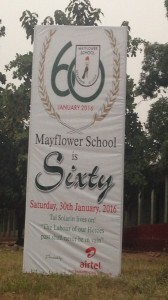 I noticed the big banner announcing that the school will be sixty (60) years old in January 2016. This wasn’t surprising, I am more amazed that despite the demise of Tai & Sheila Solarin, the Solarin family has carried on strong in managing the school. I drove inwards and soon saw students sited on the lawn and studying their books. It dawned on me that the public power system was unavailable and instead of the students to loaf around, they were meaningfully engaged in reviewing their books using the natural sun light and the free cozy breeze. As I drove back towards the gate, I noticed a building inscribed as the School’s Bakery. I also saw the moulded bursts of both Tai and Sheila next to the national flag of Nigeria. I drove out of the gate, fully elated that finally I got to enter the school. Having attended Lagelu Grammar School and turning out as pleasant as I did, I am without any regrets in not attending Mayflower. However, my heart will always think of Mayflower in good lights. Little Acts that destroy our nation.